Cream/offwhite pages, 5' bottom spine split Fr/G $1,350 Make An Offer! Offwhite pages CGC 7.0 F/VF $5,250 Make An Offer! QUALIFIED - 3 hole punches through book, Offwhite pages CGC 3.5 VG- $2,000 Make An Offer! Offwhite pages, classic robot cover CGC 8.5 VF+ $5,000 Make An Offer! White pages, small K written on front cover in pencil, crack on back of holder, being reholdered CBCS 7.0 F/VF $3,500 Make An Offer! 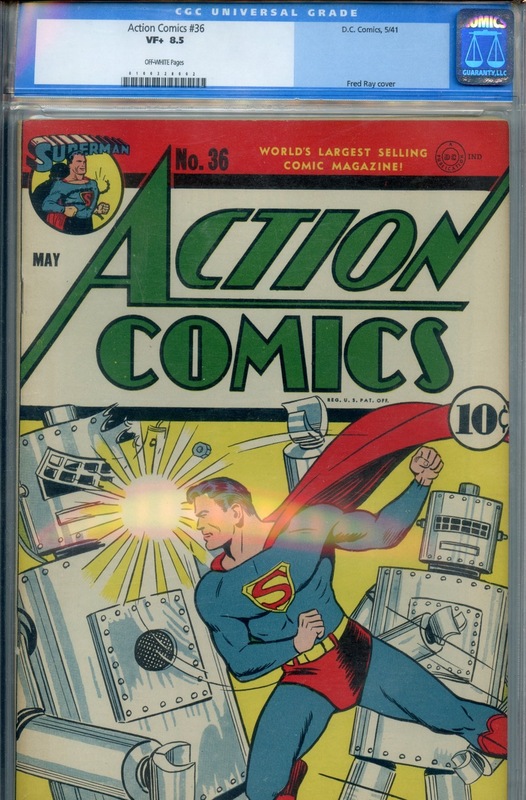 Offwhite pages, small scratches in front cover, one below Superman chin in paper stack F+ $650 Make An Offer! Offwhite pages, manufactured with one extra staple F $325 Make An Offer! White pages, really nice copy VF-/VF $425 Make An Offer! Offwhite pages, Light small T written on front cover in pencil VG $120 Make An Offer! Offwhite pages G+ $80 Make An Offer! Offwhite pages, small T written on front cover G+ $80 Make An Offer! Offwhite/white pages, tiny C written on front cover in pen, very light 5 24 written on back cover in pencil CGC 7.5 VF- $350 Make An Offer! Offwhite pages VG/F $135 Make An Offer! Offwhite pages VG/F $100 Make An Offer! Offwhite pages VG+ $150 Make An Offer! Offwhite/white pages CGC 6.5 F+ $225 Make An Offer! Complete, offwhite pages Fr $20 Make An Offer! Offwhite pages VG+ $135 Make An Offer! No back cover, offwhite pages Pr $10 Make An Offer! Xerox cover, cream pages Pr $10 Make An Offer! VF+ $275 Make An Offer! Offwhite pages, tiny 9-5 written on front cover in pen F+ $185 Make An Offer! VF+ $235 Make An Offer! White pages, C11/25 written on front cover G+ $50 Make An Offer! Offwhite/White pages, C12/31/ written on front cover G $42 Make An Offer! Offwhite pages VF $300 Make An Offer! White pages, C2/24/ written on front cover G+ $50 Make An Offer! Offwhite pages VF $500 Make An Offer! White pages, 3' spine split from bottom to lower staple, tiny C4/20 written on front cover G $80 Make An Offer! Offwhite pages VG+ $95 Make An Offer! White pages, C8/25/ written on front cover VG $65 Make An Offer! Offwhite pages, David Bradley written on splash page G $28 Make An Offer! White pages, C9/30 written on front cover VG $65 Make An Offer! Incomplete, missing 3 wraps, offwhite pages Pr $5 Make An Offer! Cream/offwhite pages, Stuart Brody stamped on front cover, 5 Written in pen G $28 Make An Offer! White pages, C12/29 written on front cover, cover detached from bottom staple G $40 Make An Offer! White pages, C3/1 written on front cover VG $75 Make An Offer! White pages, C3/29 written on front cover VG $60 Make An Offer! Cover detached, offwhite pages, Stuart Brody stamped on front cover Pr $12 Make An Offer! Cream/offwhite pages, Large E written on front cover in pen G+ $30 Make An Offer! Offwhite/white pages VG+ $195 Make An Offer! Offwhite pages VG $110 Make An Offer! Offwhite pages VG $48 Make An Offer! Offwhite pages, Large L written on front cover in pen G $21 Make An Offer! offwhite pages VF/NM $250 Make An Offer! Anybody chasing 10 centers knows that they are tough to find in high grade, offwhite/white pages, nice copy VF+ $225 Make An Offer! Cream pages, NOV 29 1960 stamped on back cover, miscut VF/VF+ $140 Make An Offer! Offwhite pages, C11/29 written on front cover VG+ $65 Make An Offer! Offwhite pages, complete, cover detached Pr $8 Make An Offer! Offwhite pages, nice copy NM- $400 Make An Offer! Offwhite pages G $21 Make An Offer! Offwhite pages, C1/31 written on front cover F- $70 Make An Offer! Cream/offwhite pages, complete Fr/G $10 Make An Offer! Cover detached, complete, offwhite pages Pr $12 Make An Offer! offwhite pages, because the books were stacked inks from the cover above this book are on the fc VF/NM $155 Make An Offer! offwhite pages G+ $25 Make An Offer! Offwhite/white pages, light back cover impression on front cover from being stacked VF/NM $155 Make An Offer! Offwhite pages F+ $90 Make An Offer! Offwhite pages, P6-7 written on front cover in penoriginal owner collection F- $55 Make An Offer! Offwhite pages, C6/28 written on front cover, light rust bottom staple F+ $90 Make An Offer! Offwhite pages G $24 Make An Offer! Offwhite pages VG $42 Make An Offer! Offwhite pages G $10 Make An Offer! Offwhite pages, original owner collection VF $145 Make An Offer! Offwhite/white pages, C11/11 written on front cover F $45 Make An Offer! Offwhite pages, cover detached from bottom staple G $13 Make An Offer! Offwhite pages, ad cut out of back cover G- $18 Make An Offer! White pages VG+ $30 Make An Offer! coverless, offwhite pages Pr $4 Make An Offer! White pages, C3/7/ written on front cover, centerfold detached from top staple F $33 Make An Offer! Offwhite pages G+ $16 Make An Offer! White pages, C3/28/ written on front cover F/VF $60 Make An Offer! Offwhite pages Fr/G $6 Make An Offer! White pages, C5/1 written on front cover F+ $40 Make An Offer! Offwhite pages G $12 Make An Offer! White pages, C5/29 written on front cover F/VF $60 Make An Offer! White pages, cover detached from bottom staple VG/F $28 Make An Offer! Offwhite pages, large stain back cover G $12 Make An Offer! Offwhite pages, cover detached from bottom staple G $12 Make An Offer! White pages, C9/4 written on front cover VF+ $185 Make An Offer! Offwhite pages, tiny 115 written on back cover in pen F $50 Make An Offer! Cover almost detached, complete, offwhite pages Pr $4 Make An Offer! Offwhite pages, cover detached from bottom staple VG $20 Make An Offer! White pages, C2/4/ written on front cover F/VF $55 Make An Offer! Offwhite pages, centerfold and 1 wrap detached from centerfold Fr $6 Make An Offer! White pages, C1/11 written on front cover F+ $40 Make An Offer! Offwhite pages VG- $20 Make An Offer! White pages, C2/27 written on front cover F/VF $60 Make An Offer! Original owner collection, cream/offwhite pages VG+ $25 Make An Offer! Offwhite pages VG $24 Make An Offer! Cream/offwhite pages, cover detached from top staple G- $10 Make An Offer! White pages, manufactured with extra staple but looks popped, C4/24 written on front cover F $28 Make An Offer! Offwhite pages VG $18 Make An Offer! White pages, cover detached ffrom bottom staple, C5/28 written on front cover VG/F $25 Make An Offer! Cream/offwhite pages, complete, centerfold detached from bottom staple Fr $3 Make An Offer! White pages, C6/24 written on front cover VF $60 Make An Offer! Cream/Offwhite pages, 1/4' tear top front cover, JUN 25 1963 stamped on back cover F $30 Make An Offer! Offwhite pages VG+ $25 Make An Offer! White pages, C7/24 written on front cover, light rust at centerfold VF- $55 Make An Offer! Offwhite pages F- $24 Make An Offer! White pages, C9/21 written on front cover VF $60 Make An Offer! White pages, C10/30 written on front cover VF $60 Make An Offer! Offwhite pages VF- $58 Make An Offer! Offwhite pages, tiny 161 written on back cover in pencil VF- $55 Make An Offer! White pages VF+ $115 Make An Offer! Offwhite pages VF- $60 Make An Offer! Offwhite pages G $9 Make An Offer! White pages VF $60 Make An Offer! Offwhite pages F $28 Make An Offer! Offwhite pages, cover detached from bottom staple VG+ $24 Make An Offer! Offwhite pages G+ $12 Make An Offer! Offwhite pages F+ $36 Make An Offer! Offwhite pages F $24 Make An Offer! White pages, C8/26 written on front cover VF/NM $175 Make An Offer! Offwhite pages F/F+ $36 Make An Offer! Original owner collection, offwhite pages F/VF $36 Make An Offer! Offwhite pages, small C written on front cover in pen VF $55 Make An Offer! Offwhite pages, Pen mark on cell bar cover F $27 Make An Offer! Offwhite pages, 11-23 written on front cover in pen NM $200 Make An Offer! Offwhite/white pages VF/NM $170 Make An Offer! Original owner collection, offwhite pages VF-/VF $45 Make An Offer! Offwhite pages, tiny C written on front cover in pen F- $16 Make An Offer! Offwhite pagfes, 12-22 written on front cover in pen NM $165 Make An Offer! Original owner collection, offwhite pages, nice copy VF $45 Make An Offer! Offwhite pages F/VF $40 Make An Offer! Offwhite pages, 1-25 written on front cover in pen NM $175 Make An Offer! Offwhite pages NM- $115 Make An Offer! Original owner collection, offwhite pages VF-/VF $40 Make An Offer! Offwhite pages, tiny 2 25 written on front cover in pen VF/NM $95 Make An Offer! Offwhite pages VF- $48 Make An Offer! White pages VF/NM $125 Make An Offer! Offwhite pages VF/NM $95 Make An Offer! Offwhite pages F+ $30 Make An Offer! Offwhite pages Fr/G $2 Make An Offer! Offwhite pages, 1.80 written on front cover F- $20 Make An Offer! Offwhite pages, centerfold detached from top staple F+ $30 Make An Offer! White pages, C7/28 written on front cover, cover detached from top staple VG/F $18 Make An Offer! Offwhite pages Fr/G $3 Make An Offer! Offwhite pages, 8 23 written on front cover in pen VF/NM $95 Make An Offer! Offwhite/white pages VF/VF+ $65 Make An Offer! Original owner collection, offwhite pages, cool cover VF- $40 Make An Offer! Offwhite pages, pen marks on Superman's boots VG+ $20 Make An Offer! Offwhite/white pages F/F+ $30 Make An Offer! White pages, tiny c11/31 written on front cover VF+ $65 Make An Offer! Original owner collection, offwhite pages F+ $25 Make An Offer! Offwhite/white pages F $24 Make An Offer! White pages, C12/22 written on front cover, cover detached from bottom staple VG/F $18 Make An Offer! Offwhite pages, cover detached from bottom staple VG+ $20 Make An Offer! White pages VF $70 Make An Offer! Offwhite/white pages F $32 Make An Offer! Offwhite/white pages, MAR 30 K stamed on back cover NM- $115 Make An Offer! Offwhite pages VF $55 Make An Offer! Offwhite/white pages, nice copy VF/NM $90 Make An Offer! White pages, C5/31 written on front cover in pen F $25 Make An Offer! Offwhite pages VG $16 Make An Offer! White pages, tiny C3/31 written on front cover VF+ $70 Make An Offer! Offwhite/white pages VF/VF+ $60 Make An Offer! Offwhite pages, tiny 8-11 and A written on front cover in pen, name written on top of splash page VF- $30 Make An Offer! Offwhite pages F+ $25 Make An Offer! Original owner collection, offwhite pages, nice copy VF+ $45 Make An Offer! Offwhite pages, Small C and tiny A written on front cover in pen, name written on top of splash page VF $33 Make An Offer! Diamond Run $150 Make An Offer! Cream/Offwhite pages VF/NM $80 Make An Offer! VG $10 Make An Offer! Original owner collection, offwhite pages VF $35 Make An Offer! White pages VF- $36 Make An Offer! Original owner collection, offwhite pages F+ $20 Make An Offer! Offwhite pages, cover is attached at top staple F $21 Make An Offer! White pages VF $40 Make An Offer! Original owner collection, cream/offwhite pages VF- $30 Make An Offer! Offwhite/white pages F/VF $40 Make An Offer! White pages VF+ $65 Make An Offer! Offwhite/white pages F $21 Make An Offer! Offwhite/white pages VF/VF+ $55 Make An Offer! Original owner collection, offwhite pages, tiny 4-21 written in pencil in dc logo F/VF $25 Make An Offer! Offwhite pages, cover detached from bottom staple VG+ $18 Make An Offer! Offwhite pages F+ $28 Make An Offer! Offwhite pages F $21 Make An Offer! Original owner collection, offwhite pages, nice copy VF/VF+ $40 Make An Offer! Offwhite pages VF- $30 Make An Offer! Offwhite pages F/VF $32 Make An Offer! Original owner collection, offwhite pages VF+ $45 Make An Offer! Offwhite pages VF/VF+ $60 Make An Offer! Offwhite pages, centerfold detached from top staple VF- $38 Make An Offer! Offwhite/white pages VF $45 Make An Offer! Offwhite pages F- $25 Make An Offer! Offwhite pages NM- $90 Make An Offer! Offwhite pages, big stain back cover G $6 Make An Offer! Offwhite pages, light subscription crease VG+ $15 Make An Offer! Offwhite pages NM $120 Make An Offer! Offwhite pages VF $38 Make An Offer! Original owner collection, offwhite pages, tiny bottom corner edge rub VF $32 Make An Offer! Offwhite pages NM $125 Make An Offer! Original owner collection, offwhite pages, nice copy, Adams VF/NM $60 Make An Offer! Offwhite pages F/F+ $18 Make An Offer! Offwhite pages VF $28 Make An Offer! Offwhite pages VG+ $15 Make An Offer! Original owner collection, offwhite pages VF $30 Make An Offer! Offwhite pages F- $7 Make An Offer! Offwhite/white pages F/VF $15 Make An Offer! Offwhite pages VG/F $7 Make An Offer! Original owner collection, cream/offwhite pages, 10/27 written on fc in pencil VF+ $25 Make An Offer! Offwhite pages VF/VF+ $22 Make An Offer! White pages NM- $45 Make An Offer! Offwhite pages VF/NM $32 Make An Offer! Original owner collection, offwhite pages VF $20 Make An Offer! Original owner collection, offwhite pages, nice copy NM- $48 Make An Offer! VG $6 Make An Offer! F $9 Make An Offer! Offwhite pages VF- $16 Make An Offer! White pages F/VF $15 Make An Offer! Cream/offwhite pages VG+ $10 Make An Offer! F- $7 Make An Offer! Cream/Offwhite pages VF/NM $36 Make An Offer! Original owner collection, offwhite pages, 7 27 written on fc in pencil NM- $65 Make An Offer! White pages VF+ $30 Make An Offer! Offwhite pages VG+ $10 Make An Offer! Offwhite pages F $12 Make An Offer! Original owner collection, offwhite pages, 9 27 written in pencil next to C on FC NM- $65 Make An Offer! VF- $18 Make An Offer! White pages CGC 9.6 NM+ $125 Make An Offer! VF/NM $35 Make An Offer! Offwhite pages G $4 Make An Offer! Original owner collection, offwhite pages NM- $65 Make An Offer! Offwhite pages VF $19 Make An Offer! White pages, L 29 written on front cover, tiny chip out of front cover VF- $16 Make An Offer! Original owner collection, offwhite pages, tiny 12 28 written on fc in pencil NM- $65 Make An Offer! Offwhite pages F- $10 Make An Offer! Offwhite/White pages CGC 9.6 NM+ $125 Make An Offer! Offwhite pages VF/NM $36 Make An Offer! Offwhite/white pages, rich colors VF+ $30 Make An Offer! Offwhite pages VF $18 Make An Offer! F+ $12 Make An Offer! White pages CGC 9.4 NM $80 Make An Offer! Original owner collection, cream/offwhite pages VF $25 Make An Offer! Offwhite pages VF $22 Make An Offer! Offwhite/white pages VG+ $5 Make An Offer! Original owner collection, tiny color fleck by top staple, offwhite/white pages NM-/NM $28 Make An Offer! Offwhite pages VF/NM $15 Make An Offer! Offwhite/white pages NM $20 Make An Offer! Offwhite/white pages VF+ $15 Make An Offer! Offwhite/white pages VF- $8 Make An Offer! Original owner collection, offwhite pages VF/NM $20 Make An Offer! White pages VG/F $5 Make An Offer! NM $28 Make An Offer! Original owner collection, offwhite pages NM-/NM $28 Make An Offer! White pages VF/NM $15 Make An Offer! White pages, tiny 2 22 28 written on front cover NM-/NM $24 Make An Offer! Offwhite pages NM $28 Make An Offer! White pages, tiny 221 written on front cover VF $10 Make An Offer! Original owner collection, offwhite pages NM- $25 Make An Offer! Offwhite pages VF/NM $17 Make An Offer! Offwhite/white pages F+ $7 Make An Offer! Offwhite/white pages F/VF $8 Make An Offer! Original owner collection, sweet copy, offwhite pages NM $32 Make An Offer! Offwhite/white pages NM $16 Make An Offer! Offwhite pages VF/NM $14 Make An Offer! White pages VF+ $10 Make An Offer! Offwhite pages VF/VF+ $10 Make An Offer! NM $20 Make An Offer! Offwhite pages VF/NM $9 Make An Offer! Offwhite pages NM $24 Make An Offer! Offwhite/white pages VF+ $9 Make An Offer! Original owner collection, offwhite pages, deep rich inks, nice copy VF/NM $16 Make An Offer! Offwhite pages VF- $7 Make An Offer! Original owner collection, offwhite pages VF/NM $16 Make An Offer! Offwhite/white pages VF- $7 Make An Offer! Original owner collection, offwhite pages NM- $20 Make An Offer! Offwhite pages NM- $16 Make An Offer! Offwhite/white pages NM $30 Make An Offer! Original owner collection, sweet copy, offwhite pages NM- $32 Make An Offer! Offwhite pages VF+ $15 Make An Offer! Offwhite pages VF+ $9 Make An Offer! Offwhite/white pages VF/NM $12 Make An Offer! Offwhite pages NM $25 Make An Offer! Offwhite/white pages NM- $14 Make An Offer! White pages NM $16 Make An Offer! Offwhite pages VF $6 Make An Offer! Offwhite pages G $1 Make An Offer! Offwhite pages VF $24 Make An Offer! Offwhite/white pages, 194-520 written on back cover in pen VG+ $4 Make An Offer! Offwhite/white pages NM+ $20 Make An Offer! Offwhite/white pages VG+ $4 Make An Offer! Offwhite/white pages F- $5 Make An Offer! Offwhite/white pages F+ $4 Make An Offer! White pages F+ $4 Make An Offer! White pages NM- $20 Make An Offer! White pages NM- $8 Make An Offer! White pages VF/NM $12 Make An Offer! White pages VF- $7 Make An Offer! White pages NM $7 Make An Offer! White pages CGC 9.8 NM/M $75 Make An Offer! Offwhite/white pages VF $3 Make An Offer! Offwhite/white pages NM+ $7 Make An Offer! Offwhite/white pages NM $6 Make An Offer! White pages, black canary cover NM- $6 Make An Offer! Offwhite/white pages NM $5 Make An Offer! Offwhite/white pages NM+ $5 Make An Offer! Offwhite/white pages, Supergirl cover/story NM $8 Make An Offer! White pages CGC 9.8 NM/M $60 Make An Offer! White pages CGC 9.8 NM/M $600 Make An Offer! White pages CBCS 9.6 NM+ $60 Make An Offer! White pages CGC 9.4 NM $30 Make An Offer! White pages CGC 9.0 VF/NM $25 Make An Offer!